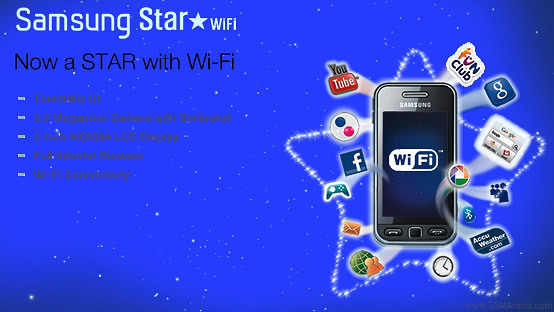 Samsung surely haven't gone out of their way to popularize that one, but we just stumbled on some pretty interesting version of the highly popular Samsung Star - one with Wi-Fi, which is quite naturally called Samsung S5230W Star WiFi. The "Star with Wi-Fi" will hit the markets in Africa and Asia as well but under a slightly different model number - the Samsung S5233W - nevertheless it's still the same Star. Samsung have already sold the original Star in more than 5M units, so this is an attempt to boost the sales even further. Except for the Wi-Fi, the rest of the specifications of S5230W remain the same as the original Star - even the dimensions and weight are the same. The new S5230W Star WiFi is already on sale in some retail sites (eBay including) and it runs around 250 US dollars, which is only a tad higher than the unsubsidized price of the original Star. The Samsung Star WiFi will be available in black, silver, pink and white colors. hello u need to convert it to mp4 nd it should be 15fbs,240x160,acc - 64kbit. hope it helps.